Stuttgart’s Where IT works business IT trade fairs are the only place to be between 24 and 26 September 2013. Is CodeTwo coming? You bet. We will be stationed in Hall 3, Stand 3B37, presenting our newest software for Exchange Server 2013, Outlook 2013 and Office 365. Our product offer keeps getting bigger and bigger, mainly thanks to constructive feedback from you – our customers and users! In Stuttgart you will be able to give us your thoughts via an online survey. Everyone who fills it out will automatically take part in a contest to win a silver HTC One. 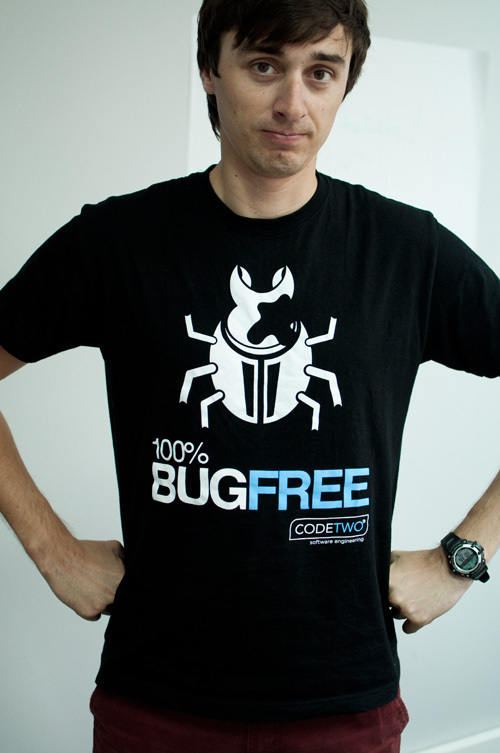 The winner will be drawn on the last day of the fair (26 September 2013), but he or she won’t be the only person walking away with a prize – we will also be giving away our famous “100% Bug Free” t-shirts. So make sure to drop by Stand 3B37 for a chat and some bug free attire! Wunderbar! Hi Ralf, we will be happy to meet you too! Our German speaking representative, Piotr Nürnberg, will contact you directly.